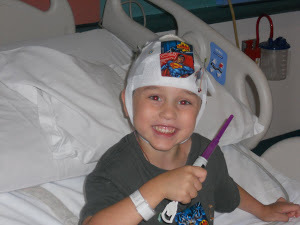 Some months ago I shared about a brave little boy as he headed into hospital for a five-day video EEG. We’ve since learned that what Renn is dealing with is Complex Partial Epilepsy. Life has been a roller-coaster of ups and downs, hoping he can adjust to medication, watching as seizure after seizure makes life as a normal five-year-old kid more and more difficult. In the past several months, I’ve grown very close to Renn and his family, and my heart goes out to them as they face their next challenge. Yesterday they thought they were going to a simple meet-the-new-doctors consultation, and planning for another video EEG. Instead, the doctor has laid out a plan that likely includes brain surgery, such a scary prospect. Bethany, Renn’s mom, has started a blog to chronicle Renn’s journey through whatever lies ahead. I’d urge you to read the blog, share it, follow it, and offer this family your caring and support as they deal with all this. Grammie Beff is pulling for you, little Jedi! May the Force be with you! 12 x 12 in 2012 on 12/12/12 — an End of Year Celebration!